Okay, I've been trying this all last night, and most of today, and I'm stumped. I registered just to get some more experienced opinions on this. I have seen widespread reports of dgVoodoo2 working to amazing extents, yet it fails to do anything for me except sit there, I'd really like to know what I'm doing wrong. I've tried it with the setup utility in the directory, without. Tried custom resolution, enabled 3D Accelerator (As some had suggested) in the ingame options, tried it without the Accelerator enabled. I'm pretty stumped. Am I missing something rather simple here? Highly likely that I am, but all the tutorials say to simply copy the files over and config in dgvoodoosetup utility. I even installed DirectX 9.0 offline installer from Microsoft, incase it needed that for some reason. Any help would be fantastic, as I'm unsure of what to do next quite honestly. I've also tried the Glide wrappers, incase that would've worked for some reason, and it still hasn't done a thing for me yet. It's now safe to shut off your computer. You should use either "feature level 10.1" or "Best available one" as Output API. Some features are not available on feature level 10.0. Also enable the dgVoodoo watermark to check if dgVoodoo is working. 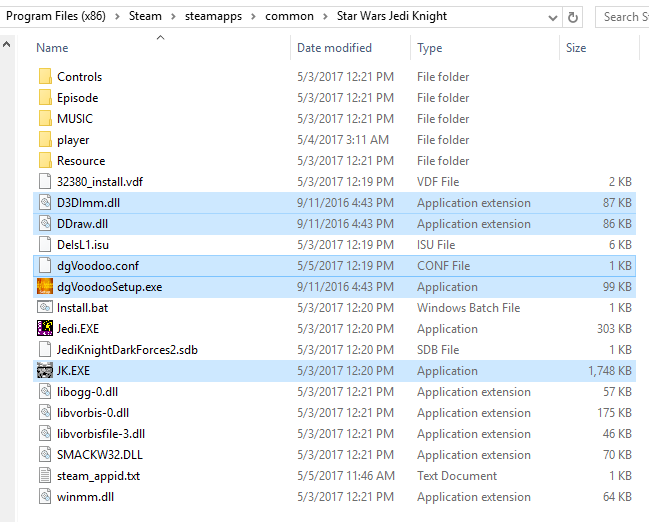 The menus of the Steam version won't take adavantage of dgVoodoo. To change that replace the exe with a different one, see http://steamcommunity.com/app/32380/dis ... 477605824/ and https://steamcommunity.com/app/32380/di ... 395973042/ . Lastly, what exactly do you want to accomplish with dgVoodoo? That exe fix worked, though it's having trouble aligning the mouse on the screen properly, I'll probably have to fuddle around with the settings. But I was able to get Jedi Knight windowed, exactly what I wanted. Thank you.